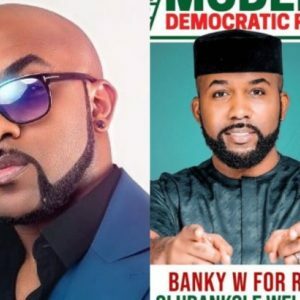 In a bid to project himself as the fittest candidate to be elected into the House Of Representatives, Nigerian singer turned politician, Banky-W recounted his track record during Town-hall Meeting to his potential electorates. The EME boss is the Morden Democratic Party (MDP’s) candidate for the House of Representatives in EtiOsa federal constituency in Lagos state. As elections draw nearer, Banky is intensifying his campaign as he hopes to win a seat in the House of Representatives. His latest strategy to doing so has been to recount his track record in the music world. He pointed out that the successes of Masterkraft, one of Nigeria’s most sought music producer, and Wizkid, Africa’s pop superstar was based on his ability to look beyond himself to help others. According to him, track records like this and much more, makes him the best candidate for the job. But many Nigerians are not buying this from him. Banky has been questioned about his dealings with Wizkid in particular, as fans ask if his establishment of Wizkid was an act of selflessness or was for the gains involved. He was further asked why the case wasn’t the same with Skales who he dropped because he wasn’t as profitable as Wizkid. In your opinion, does Banky merit votes based on his claim??? GET VISA AND Travel to USA, UK, CANADA, DUBAI LOTS MORE WITH JOB OFFERS AND ACCOMMODATION CALL Mr. KUNLE 08136562734 TO APLLY NOW.